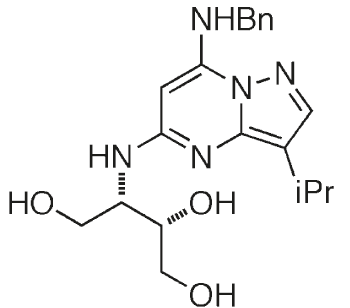 Relevance BS-194 is a selective and potent CDK inhibitor, which inhibits CDK2, CDK1, CDK5, CDK7, and CDK9. Heathcote et al. 2010. J Med Chem. 53(24):8508-22. PMID: 21080703. A novel pyrazolo[1,5-a]pyrimidine is a potent inhibitor of cyclin-dependent protein kinases 1, 2, and 9, which demonstrates antitumor effects in human tumor xenografts following oral administration.